By this point we’ve seen most of NVIDIA’s 2018 Turing GPU product stack. After kicking things off with the Quadro RTX series, NVIDIA released a trio of consumer GeForce RTX cards, and following that the first Turing Tesla, the T4. However as regular industry watchers are well aware, NVIDIA typically does one more high-end card in their product stack, and that’s the ever-popular Titan. Not quite a flagship card and not really a consumer card, the Titan none the less holds an interesting spot in NVIDIA’s lineup as the fastest card most mere mortals can get their hands on, and these days as NVIDIA’s prime workstation compute card. Last year around this time we saw the launch of the Titan V at the Neural Information Processing Systems (NeurIPS) conference. It seems like that went well for the company, as they’ve once again picked that venue for the launch of their latest Titan card, the aptly named Titan RTX. Set to hit the streets a bit later this month, the card is set to be NVIDIA’s big bruiser for workstation compute and ray tracing users – and anyone else who wants to throw down $2500 for a video card. By the numbers, the Titan RTX looks a lot like a more powerful GeForce RTX 2080 Ti. And while it’s not nearly as consumer-focused, this is certainly the most relatable way to look at it. The card is based on the same TU102 GPU as NVIDIA’s consumer flagship, but while the RTX 2080 Ti used a slightly cut-down version of the GPU, Titan RTX gets a fully enabled chip, similar to NVIDIA’s best Quadro cards. Indeed along with the GeForce comparisons, the card is also functionally very close to the Quadro RTX 6000. Which is to say that while the Titan RTX doesn’t really fall under the category of a flagship, it’s not a second-tier card: it’s as powerful and as fast as NVIDIA’s best TU102 cards, so it’s very much at the top of its game. Looking at its place in the market, with the launch of the Titan V last year, NVIDIA shifted away from the idea of a “prosumer” Titan that was closer to a GeForce with more memory and slightly higher performance, and more towards the idea of a straight-up professional grade workstation card for non-graphics tasks. Using a cut-down version of the server-grade GV100 GPU, Titan V filled this spot nicely, though it did come with some of the baggage that a server-grade GPU entails. Now that NVIDIA is back to using something closer to a workstation-grade GPU in the TU102, NVIDIA has once again shifted the balance between their cards a bit. 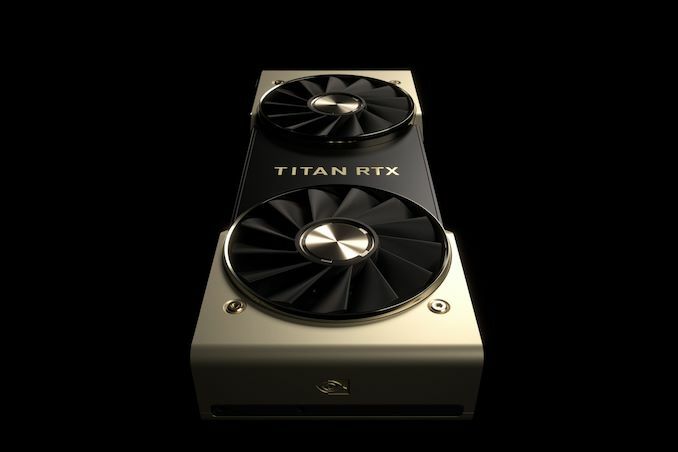 But the Titan RTX remains the company’s workstation compute card, and thanks to the Turing architecture’s ray-tracing capabilities, is also now being pitched as a ray-tracing card for content creators. Drilling a bit deeper, there are really three legs to Titan RTX that sets it apart from NVIDIA’s other cards, particularly the GeForce RTX 2080 Ti. Raw performance is certainly once of those; we’re looking at about 15% better performance in shading, texturing, and compute, and around a 9% bump in memory bandwidth and pixel throughput. However arguably the lynchpin to NVIDIA’s true desired market of data scientists and other compute users is the tensor cores. 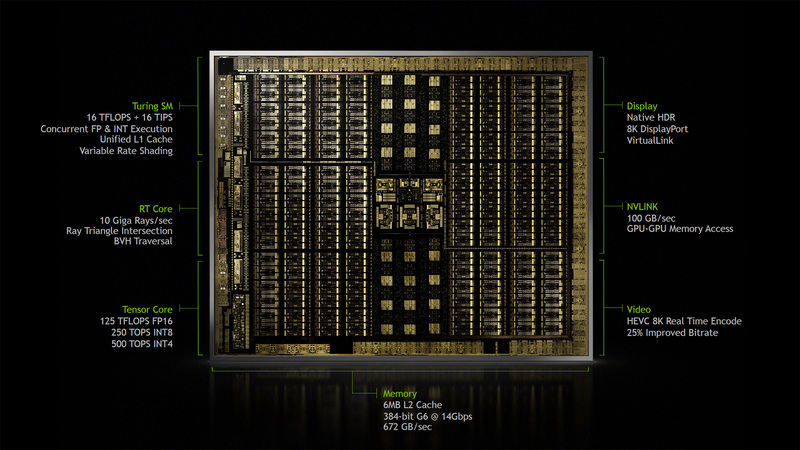 Present on all NVIDIA’s Turing cards and the heart and soul of NVIIDA’s success in the AI/neural networking field, NVIDIA gave the GeForce cards a singular limitation that is none the less very important to the professional market. In their highest-precision FP16 mode, Turing is capable of accumulating at FP32 for greater precision; however on the GeForce cards this operation is limited to half-speed throughput. This limitation has been removed for the Titan RTX, and as a result it’s capable of full-speed FP32 accumulation throughput on its tensor cores. Given that NVIDIA’s tensor cores have nearly a dozen modes, this may seem like an odd distinction to make between the GeForce and the Titan. However for data scientists it’s quite important; FP32 accumulate is frequently necessary for neural network training – FP16 accumulate doesn’t have enough precision – especially in the big money fields that will shell out for cards like the Titan and the Tesla. So this small change is a big part of the value proposition to data scientists, as NVIDIA does not offer a cheaper card with the chart-topping 130 TFLOPS of tensor performance that Titan RTX can hit. Similarly, the final leg for the Titan RTX is memory capacity. 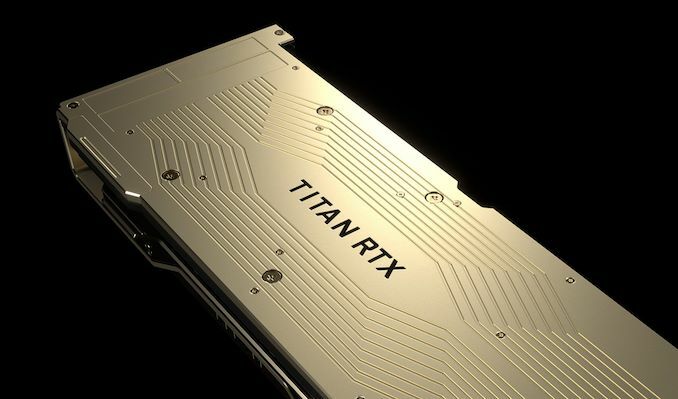 Whereas the GeForce RTX 2080 Ti is an 11GB card, Titan RTX is a 24GB card. For gamers even 11GB is generally overkill, however the extra 13GB of VRAM can make or break a large dataset. NVIDIA knows their market very well, and as we’ve seen time and time again, has market segmentation down to a fine art. Market positioning aside, the launch of the Titan RTX also means that the rest of the tensor performance benefits are finally coming to a Titan-level card. Turing introduced support for lower precision modes, which help to further set apart the Titan RTX from last year’s Titan V. Overall, data scientists who would otherwise be looking at a Titan V are looking at a doubling in VRAM capacity, a 20% improvement in tensor performance – with far more at lower precisions – and all the other improvements of the Turing architecture. And if that’s not enough, NVIDIA is also enabling NVLink functionality this time around (it was disabled on Titan V), so workstation users can also scale out for more performance with a second Titan RTX by linking up the two cards. Meanwhile NVIDIA is also chasing after content creators with this card a bit. Data scientists are still the bread and butter, but given that Turing also made significant investments into ray-tracing, NVIDIA would seem to also be experimenting a bit here to see what kind of a market there is for a high-end yet non-Quadro card for ray tracing. Strictly speaking the Quadro 6000 should be superior here (if only due to drivers & support), however it’s also a good deal more expensive. So it will be interesting to see what kind of a market NVIDIA finds for a $2500 ray tracing card that’s not already served by tried & true Quadro or the much cheaper GeForce. And while NVIDIA is the first to note that the card is not really for gaming, even the Titan V sold to some gamers out there since Titans use the GeForce driver stack, and I expect much the same here. While the potential 15% performance improvement by no means justifies the greater-than 2x jump in cost, for the crazy rich out there, I do expect the Titan RTX to be a little better suited to gaming than the Titan V was. Whereas the Titan V was an awkward card in terms of game support due to the fact that it was the only Volta architecture card to use the GeForce drivers, Turing is everywhere. So the Titan RTX should behave more like a slightly faster 2080 Ti, without so many of the performance inconsistencies we saw when trying to game on the Titan V.
In terms of design, like its predecessors, the Titan RTX also follows very closely in the stylings of the GeForce family. Notably NVIDIA is using an open-air double-fan cooler here, which NVIDIA switched to on this generation, and not a traditional blower like the Titan V or the current Quadro cards. As we’ve already seen on the GeForce cards this maximizes airflow and brings down temperatures, however it’s a bit more of a mixed bag for the Titan since NVIDIA allows pairing the cards up with NVLink. Open air cooled cards require a little more care here, whereas the blowers are pretty much set-it-and-forget-it in a workstation. However with a TDP of 280W – the highest of the Turing cards and 30W higher than the Titan V – one can see why NVIDIA would be interested in maximizing cooling performance above other priorities. This also means that in theory, the Titan RTX should average slightly higher clockspeeds than the Quadro cards, as it has a bit more cooling and TDP headroom to play with; so at least for now, it likely is the fastest of all the TU102 cards. NVIDIA's Nickname for the Titan RTX is "T-Rex"
Past that, this is a pretty typical card in terms of NVIDIA design. It gets the same port arrangement as the other Quadro and GeForce cards, with 3x DisplayPort 1.4 outputs, an HDMI 2.0b port, and a USB-C port that supports DP alt mode as well as the VirtualLink standard for VR headsets. Unique to the Titan of course is its golden color scheme, least it be confused with a GeForce. 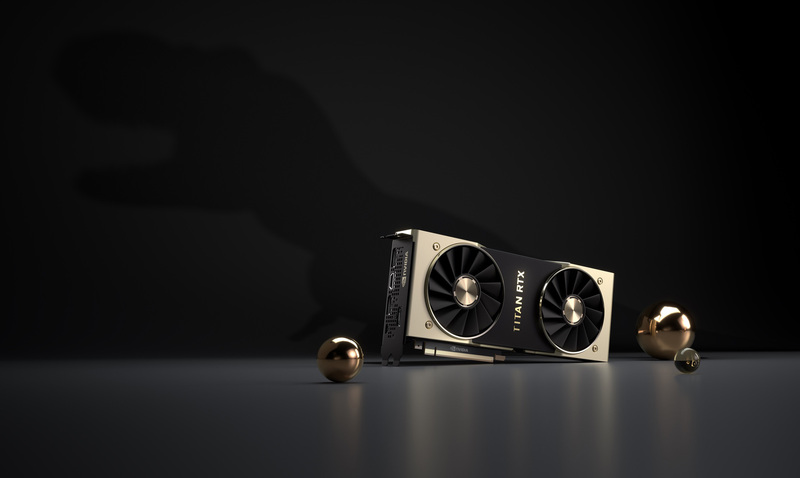 NVIDIA has nicknamed the card the T-rex, and I’m fairly sure this is the first time anyone has offered a T-rex in gold. In any case, for the data scientists and whoever else wants to get their hands on what’s sure to be NVIDIA’s tensor terror for workstations, be prepared to set aside some cash. $2500 to be precise. Atypically for NVIDIA, this price is actually down a bit from the $3000 Titan V – TU102 is cheaper to make, especially without the HBM2 – but it’s still going to be one expensive card. Meanwhile NVIDIA tells us that we should expect to see the card become available on their website later this month. You are the one wrong, many of the PS4 releases on PC are rendered at 2160p @ 60Hz. SFV, Soul Calibur 6, FFXV, CoD, Doom, the Witcher 3... most of them.